The new CX300 are Sennheiser's first entry into the in-ear-canal headphone (canalphone) market. However, rather than take on Shure, Etymotic, Ultimate Ears, and other vendors of higher-end canalphones, Sennheiser is aiming squarely at the popular -- and less expensive -- "canalbuds" such as Sony's EX70. Instead of sealing firmly inside your ear canals using foam or flanged-rubber eartips, these models have small rubber eartips that sit at the ends of your ear canals -- they don't fully seal out external noise, but they're easier to put in and take out and they're more comfortable for many listeners than full-fledged canalphones. The CX300, available in black/chrome (the CX300-B) and silver/chrome (the CX300-S), also score comfort points with their size and weight. The tiny earpieces are smaller than those used by Sony's EX70, and the entire setup -- earpieces, cables, and miniplug -- weighs just 4 grams. (Lighter weight also means the earpieces don't fall out as easily, a problem I've had with other hybrid canalphones.) Three pairs of rubber eartips are included, in different sizes to fit different ears. Finally, the CX300 cables use the recently-popular asymmetrical design in which the right earbud's cable is significantly longer than the left's. This approach is supposed to minimize cable interference -- the main cable goes directly to your left ear and then then the cable to the right bud can be draped behind your neck or under your chin. I'm personally not a fan of this design, but may people are. And one accessory we were surprised to see missing form the CX300 package was a case of some sort; most Sennheiser headphones we've reviewed include one. 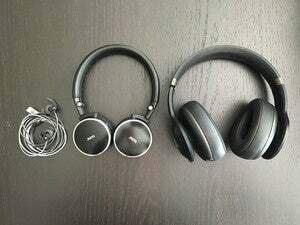 In terms of sound quality, the CX300 can't compete with the impressive audio of higher-end canalphones such as Ultimate Ears' $100 super.fi 3 Studio, but they hold their own against similarly priced canalbuds from Sony and the like; and they offer significantly better sound quality than traditional earbuds. Bass response is especially impressive compared to earbuds, but is more balanced than the boomy lows of Sony's popular EX70/EX71. Detail and midrange are also good, although treble can sound a bit distant and hollow at times. Like all canalphones and canalbuds, you get much better bass response, noise reduction, and overall sound quality with a good seal between the eartips and your ear canals, and the CX300's stiff cables do exhibit microphonic effects -- bumps and scrapes to the cables can be heard, sometimes loudly, in the headphones.